Most drinkers out there have heard of Old Tom gin, in the "Yeah, I'm pretty sure that's a thing" sense. But the majority probably couldn't actually tell you what it is. We’re here to change all that. Unlike most of the juniper-heavy gin we drink today, which is typically in the London Dry style, Old Tom has a pleasant, rounded sweetness to it that makes it a fun substitute for your standard Beefeater. While Old Tom fell out of fashion decades ago, a number of today's brands have recently released their own versions, making Old Tom gin new again. Of all the big name brands trying their hands at Old Tom, our favorite is Tanqueray, which we’re using here. We like it for its mellow sweetness, balance of citrus and juniper flavors, and richness on the palate. 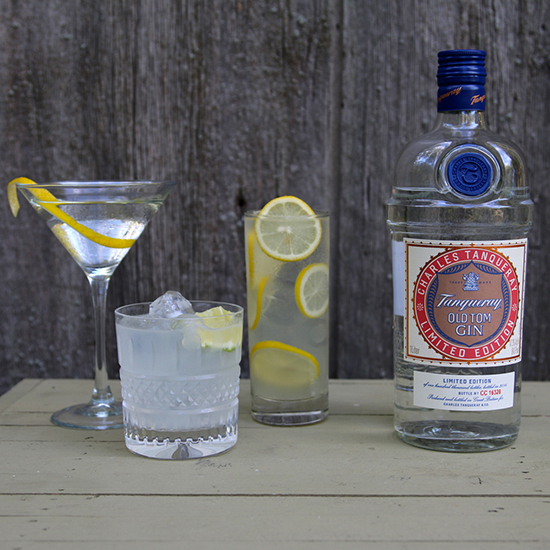 The best way to test the mettle of any gin is in a martini. If you're a fan of super-dry vodka martinis (you know that's just a glass of cold vodka, right? ), an Old Tom 'tini might come as a surprise: richer and rounder in the mouth, with a little sweetness we love. Instructions: In a mixing glass with ice, combine two ounces of Old Tom gin, an ounce of dry vermouth (we like Dolin dry), and three dashes of orange bitters. Stir until very well chilled—at least 30 stirs—and strain into a martini glass. Garnish with a lemon peel, squeezing it over the top first skin-side down, to release all its citrus oils. We couldn't possibly take Old Tom out for a spin without testing it out in a Tom Collins—which, perhaps not surprisingly, was named after Old Tom gin. This classic, dating back to the mid-19th century, is among the most refreshing cocktails out there. Instructions: In a cocktail shaker with ice, combine an ounce and a half Old Tom gin, half an ounce of lemon juice, and half an ounce simple syrup (equal part sugar dissolved in hot water). Shake that all up and strain into a Collins glass filled with ice. Top with 4 ounces of soda and garnish with a lemon wheel or few. Another gin classic. Back in the day, gimlets were made with Rose's Lime Juice, the syrupy stuff in that little bottle—but we've all moved beyond that, right? Try our modern version instead, with fresh lime and a little simple syrup to balance it out. Instructions: In a cocktail shaker with ice, combine 2 ounces Old Tom gin, an ounce of freshly squeezed lime juice, and half an ounce of simple syrup (equal part sugar dissolved in hot water). Shake that all up and strain into a rocks glass with fresh ice. Garnish with a lime wedge.